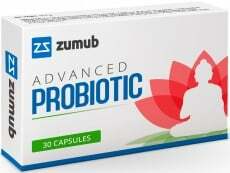 Zumub Advanced Probiotic capsules feature a carefully calculated mix of top-quality probiotics designed to support your overall well-being, but especially the well-being of your intestine. Each capsule of Zumub Advanced Probiotic contains strains of live bacteria that are generally classified as ‘good’ or ‘helpful’. Inspired by the advances of cutting edge science, this product offers the benefits of both bifidobacteria and lactobacilli - the two main groups of bacteria that can support the intestinal flora. The positive effects can bring much more than tummy comfort. By making use of Zumub Advanced Probiotic capsules, you prepare a powerful background for proper functioning of every system in your body. The correct ratio of bacteria types in the gut ensures the most effective absorption of the nutrients and boosts the protective potential of the organism, giving it the resources to fight off negative effects of harmful microorganisms. When Is It A Good Idea To Take Zumub Advanced Probiotic Capsules? Whether you are unsatisfied with the way your digestive system works or just feel it needs extra support, buying may satisfy your needs. The capsules are also worth taking while travelling to prevent digestive problems from spoiling the journey. With Zumub Advanced Probiotic it is easier and convenient to enjoy the goodness of pure bacteria. In creating these capsules, we have taken both quality and price into account, so we strive to produce a product with a very competitive price without compromising its quality. Convince yourself and give the right support to your body. Have a question about Advanced Probiotic? What is it, what does it do, how and when to use or something else? Ask us. ALLERGEN INFORMATION: May contain allergens handled in the production facilities, such as cereals containing gluten, egg, soy, sulphites, fish, molluscs or crustaceans. As a supplement, take 1-2 capsules a day, preferably with a meal, or as suggested by a healthcare professional. WARNINGS Advanced Probiotic : Do not exceed recommended dosage. Keep out of reach of children. This product should not be used as a substitute for a varied and balanced diet & healthy lifestyle. This product should not be used in case of hypersensitivity or allergy to any of its constituents. Store in a cool, dry place. Please Recycle.